Since this is an activity pack for kids I wanted to know what my 5 yr. old thought about it. At first when I showed him he thought we were going to do “work.” Little did he know that he was actually going to have fun while learning! That is exactly what this activity pack is! Filled with fun learning activities for children ranging from Pre-K through 4th grade. I was provided with a complimentary copy of the Multicultural Kid Blogs’ World Soccer Cup Activity Pack for review; however, all opinions are my own. He also enjoyed saying out loud words in Portuguese, and he pointed out how similar it was to Spanish. Then he said all of the vocabulary words in English, Portuguese, and Spanish. He practiced both his sorting, and writing skills! His favorite part was the color by numbers in Portuguese! We spent a good time of our Sunday evening going through the packet. He would tell me what activity he wanted to do. The matching flags with the country’s name was a hit! We went to the map to see where they were located, and as a reference he checked out the flag collection that we have. He was excited to see that we had an actual flag from Mexico, and England! Most of the activities that we did were more from the preschool through first grade range: coloring pages, matching, vocabulary, and score sheets. However, this pack is also ideal for the older kids ranging from second through fourth grades with tournament score books, word scramble, and word search (which I might add my 5 yr. old has completed). 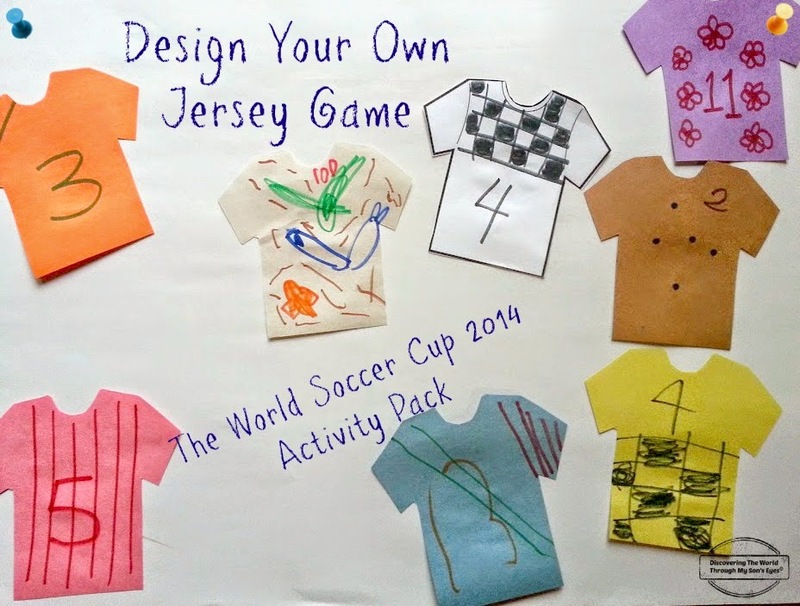 fun games such as, creating your own jersey, and guessing what team will win! Everything you need to teach your child about FIFA’s World Cup can be found in this activity pack! I highly suggest you get a copy for you and your children! You can get the copy here. For more about the World Cup go to Multicultural Kid Blogs. This post is great.your article is important and helpful for sport's.This post give more new informative information for soccer.Thanks a lot for share your great post.